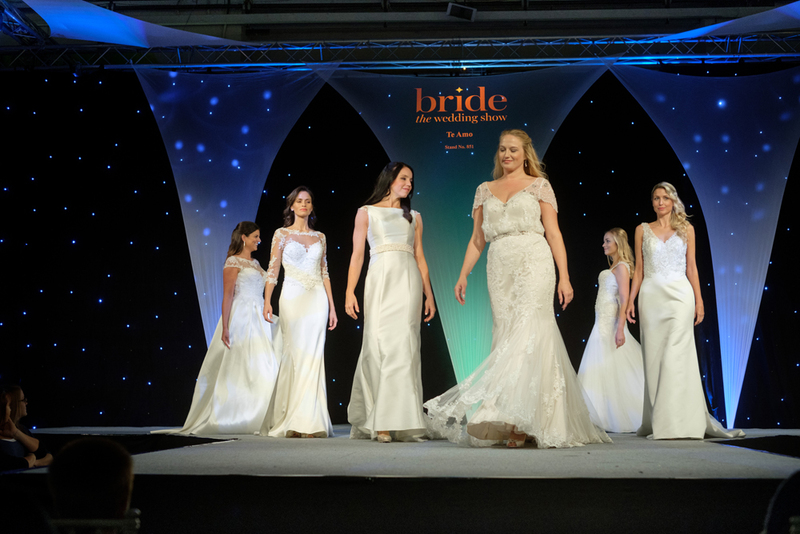 Prepare to be dazzled as the most fashion-forward designs in bridal gowns, bridesmaids’ dresses, menswear and wedding guest ensembles take to the catwalk at Bride: The Wedding Show at Westpoint Exeter on 25-26 March. As one of the longest standing bridal boutique in Exeter, The Bridal Emporium is renowned for its first-class service to brides-to-be and the team pride themselves on recommendations. Designer brands such as Mark Lesley, Mori Lee and Olivia Grace are among many of those stocked in-store. Today, The Bridal Emporium is showcasing some of its beautiful new gowns on the catwalk. Pay The Bridal Emporium a visit and be spoilt by the boutique’s professional sales consultants. You can be assured of excellent service right through to your wedding day. The in-house seamstress can undertake any alterations your gown may need and it can be safely stored free-of-charge on the premises right up to your wedding. The team can even offer a personal dresser for your big day to arrive at your house and ensure your gown is perfectly fitted, while helping with those last-minute preparations. They say fashion comes and goes but style lasts forever. Young's Hire knows a thing or two about style and how to make you look great on your big day. From slim-fit tailcoats with tweed check waistcoats and neckwear, to the classic herringbone short jacket, you'll find something to cater for every taste. You can even build your own outfit online and try it on for free to make sure it's the perfect match. Build your outfit today or find your nearest store at www.youngs-hire.co.uk. With more than 200 stores nationwide, there’s one near you. The Isabelle Montagu boutique, based in Exeter, opened last autumn. Showcasing Phoebe Stockman's designer bridal label – Isabelle Montagu – and Eva Stockman's beautiful handmade accessories – Bohemies – the boutique also offers customisation and alteration services on request. The Isabelle Montagu Intemporelle collection presents unique and vintage-inspired wedding gowns and some of the gowns from this collection feature on today’s catwalk. The John Lewis Exeter branch offers an assortment of branded products, exclusive lines and own-brand merchandise across home, fashion, beauty and electrical. The John Lewis ‘never knowingly undersold’ policy is the company’s unique promise to customers on quality, service and value – you can trust that John Lewis will always stock the best quality products, responsibly sourced. John Lewis partners are highly trained to offer helpful, impartial advice on all products and provide excellent after-sales and a great choice of expert services, including personal styling and home design. In addition to shopping, John Lewis Insurance offers a range of comprehensive insurance across home and weddings, delivering the expertise, trust and customer service expected from the John Lewis brand. From ceremony to celebration, John Lewis has outfits and accessories for every wedding role, ensuring that you and your guests stand out in wedding albums for years to come. Jane’s is an exceptional and established bridal and occasionwear retailer situated on The Strand in Torquay. Jane’s stocks an extensive range of more than 40 styles of wedding dresses to suit all sizes and price ranges, including designs by Romantica, Tiffany’s, Goya and Gino Cerruti. Exciting new offerings include the Eliza and Ethan multiway dresses and the Infinity ‘create your own wedding dress’ collection. No appointment is necessary and you can be assured of a fabulous and friendly service in relaxed surroundings. Jane’s also has a range of bridesmaids’ dresses and mother-of- the-bride outfits by Mascara and Barker and Pattichis, along with prom and evening gowns. Lexus and Lunar shoes provide the finest finishing touch at a realistic price. A selection of hats, accessories and fascinators is always available. On the catwalk today, Jane’s showcases the latest bridesmaids’ dresses and wedding guest collection. Pirouette can be found in the historic West Quarter of Exeter in the world-famous ‘House that Moved’. One of the first to offer a completely private appointment, and with an individual style, brides-to-be can try on gowns by award-winning designers such as Maggie Sottero, Sottero & Midgley, Rebecca Ingram and Lou Lou Bridal. Pirouette’s bridesmaid collection is by Ebony Rose. What makes Pirouette stand out is the boutique’s in-house, bespoke alteration service where individual tailoring can make your gown unique to you. Ensuring the men look the business on your wedding day is a vital cog in the wheel of organisation. With so much to think about, let the team at Jonathan Hawkes take away the stress of ensuring that the groom and groom’s party look great. Jonathan Hawkes offers a free one-hour consultation with an experienced member of staff in a relaxed atmosphere, giving you the opportunity to match colours for ties and waistcoats. The store carries a vast range of suits, from the traditional tails to slim-fit lounge suits, all in a choice of colours. See the boys on the catwalk for a taste of what Jonathan Hawkes has to offer. Prudence Gowns is a luxury bridal boutique with stores in Plymouth and Exeter. Formed in 1982, Prudence Gowns has more than 30 years of experience in helping brides-to-be from Devon and Cornwall find their perfect wedding dress. The boutique’s expert staff dedicate at least 90 minutes to each and every bridal appointment as they know that choosing a wedding dress can be an overwhelming experience. The shop offers a unique collection of bridal gowns, from designers such as Maggie Sottero, Sottero and Midgley, Sincerity, Justin Alexander, Mori Lee and Ronald Joyce, to name but a few. All dresses are sourced with great thought for every bride, with a wide range of sizes and styles for all budgets to make your special day perfect. On the catwalk, Prudence Gowns will be showcasing stunning new collections of wedding dresses from leading Italian design house Demetrios. This renowned international designer offers women the widest and most versatile styles, and is on the cutting edge of the fashion world. Bride: The Wedding Show is coming to Westpoint Exeter on 25-26 March bringing together more than 130 of the region’s finest wedding suppliers under one roof. As well as the show-stopping catwalk shows taking place three times each day, there will be live music, a Champagne bar, free copies of South West Bride magazine to pick up and goody bags for the first 100 brides through the doors each day. Tickets cost £5 each or £15 for a group of four in advance from www.theweddingshow.co.uk/westpoint-wedding-show, or they are £7.50 each on the day.